I started ballet when I was 4. I know you're probably thinking, she doesn't seem like the ballet type, but I actually went on to take classes for the next two years. Anyway, I remember my first "recital." It must've been in the evening because I remember it was dark outside. I also earned a nickname after my performance - "Little Miss Itch." Turns out I would do my ballet move and then scratch, perform another move and scratch again, and repeat. I don't remember that part but I guess it's true because I've seen the video (okay film back then). The highlight of the evening was of course having my parents all to myself for the evening and of course going to Dunkin' Donuts afterwards! Here are a few pictures and a video of Peyton's performance. Tom and I recently had the opportunity to return to the place we spent our honeymoon - Hawaii. I was in Maui for work (lucky me) so Tom tagged along and then we extended our trip to check out another island - Kauai. and thousands of good memories and special moments over the course of the last ten years. Has it been easy? Yes. Have the years gone by fast? Yes, the days and the years. Would I change anything about our lives together. Yes, maybe moving to the suburbs sooner but who knew the market was going to fall out when it did. But we also wouldn't have met the incredible people we did if we hadn't stayed so it's a toss up, really. Hard to believe these 10 years went by this quick. I'm scared the next 10 will go by even faster but I'm definitely excited to begin the next 10 years of our life together with our two kids and our dog. Here are a few pictures of our second honeymoon. The walking path in Wailea...Tom enjoyed morning walks while I worked! Grand Hyatt Kauai awesome grounds. It's official. We are moving to the suburbs. After 15 years of living in the city, we are making the move to the suburbs just in time for Austen to start first grade. I must say I'm ready. Ready for much more space and a backyard. We've been stalking a specific area of the western suburbs for some time but only recently expanded our search and then narrowed it down again. We did a lot of research re: schools, community, commutes for both of us and just general feel of where we fit in best. I like to joke that we could move to our new suburb with our 9 year old Acura SUV and we would fit in fine. In the other town we were considering, I think I would have to have a brand new Range Rover before I could move in. So that factored into my choice a lot. So where are we with all this? We had our offer accepted on Peyton's birthday, Dec. 30, and closed on Feb. 20. It is a teardown so Tom has designed it and we are in the permit process right now but it's looking like the actual house on the current lot will be torn down this week and we'll start building. 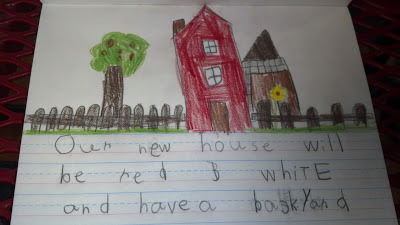 Cute story - Austen thinks that he and his dad drew the house (Austen's drawing above) so he refers to it as the drawings they drew when Tom talks about the house. I do think that kid is going to be an architect or an engineer or something similar to Tom's profession when he grows up. He's a whiz at Legos (the really hard ones that are above his age) and he likes to draw and is good at math. Anyway, the plan is for the house to be built over the course of the next six months and then we will move in mid to end of August before the start of the school year. It hardly seems real that Adler will finally have a yard and I can send Austen outside to play soccer or basketball instead of next to my China cabinet. We'll post pictures and updates as progress is made but just wanted to share the good news. At night, after we get home from work and the kids are fed, we have family time. It could be just hanging out all together while the kids play or it could be playing a game as a family. Whatever it is, it's made that much better when Adler joins us for the festivities. Tonight was a particularly fun evening with Adler playing or rather teasing Peyton by taking her stuffed animals as she's playing with them - first the unicorn then the cat! Adler pretty much has unlimited access to any of the kids toys throughout the day and you would think she'd tear them apart. But, all she does is lick them to death. Precisely why we got her. She's a big fur ball who is full of love! Since we don't live in the suburbs yet, our kids haven't had the pleasure of building a snowman in our backyard. But, this weekend they were at Grandma's and even though it's March, there was snow (and more coming) so they could build a giant snowman. Here's Austen's work of art. I think Peyton helped a little bit too. 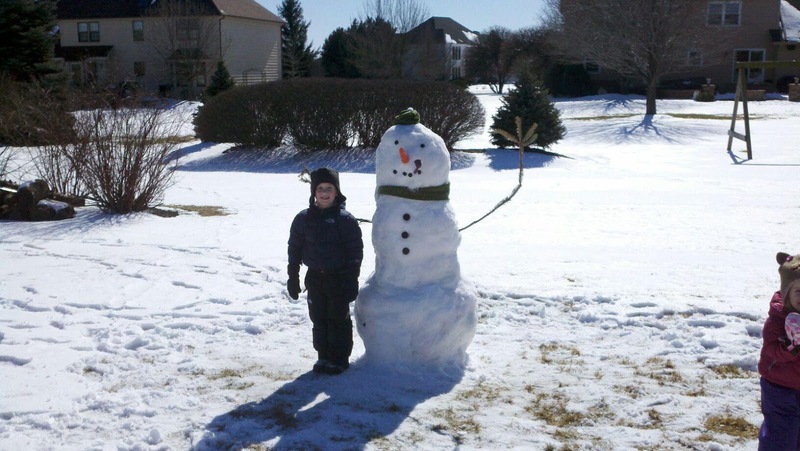 My mom said that Austen wanted to be outside for hours playing in the snow and checking on his snowman (he woke up the next morning and wanted to check on it to make sure it was still there. It was!) That kid loves to be outside. He can't wait to go back next weekend and build a fort around it with the even more snow we are expected to get this week. Can you tell this kid can't wait until he has his very own backyard in the suburbs? Only six more months, Austen.